Contrary to the image that the word often conjures up for many people, orienteering is not all about tramping the hillsides wearing a cagoule and carrying a rucksack, though the navigational skills required may well be pretty similar. True orienteering is a competitive sport – a cross country race over a set course, designed to test the runner’s ability with map and compass – affectionately known to its aficionados as “cunning running.” Having said that, it is a very inclusive pastime and going all-out to win is certainly not obligatory – leaving the way for many to jog or even walk around the course – which almost certainly accounts for its growing popularity as a holiday activity. With a range of opportunities, from half-day “tasters” to whole week courses available throughout Britain and increasingly further afield, whether you’re looking for the full-on competitive experience, or a family-friendly get-away, there should be something to suit. For a challenging outdoor sport which sets out to exercise the body and the mind, you obviously need somewhere which provides some suitably challenging outdoors! Wales has long been a favoured spot for orienteering, the variety of forest, moorland and mountain scenery and the country’s long-established tourist industry making an ideal combination. From the rugged grandeur of Snowdonia in the north to the Pembrokeshire coast, there are plenty of holiday opportunities which will let you sample orienteering, many offering it as part of a wider “activity” break. The Scottish highlands – Europe’s last true wilderness – also has more than its fair share of chances to learn some map and compass work and clear appeal for anyone looking for a real get-away from it all experience, while England’s Lake and Peak Districts also have their own attractions. For serious enthusiasts, a number of centres abroad – particularly in Spain and Portugal – offer orienteering travel-packages and training camps which combine interesting and varied terrain with the chance to visit regions with a rich culture and good weather. The packages provide for all levels of fitness, ability and age, making them ideal for individual travellers, families or friends. Alternatively, some of the holidays on offer are deliberately left more flexible which allows them be tailored to suit individual tastes. 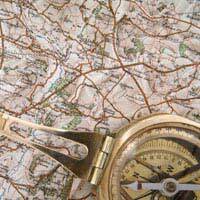 If the idea of map-reading appeals – but the thought of all that running around the countryside doesn’t – you can still enjoy an orienteering holiday. Avid cyclists, for instance, can swap their eco-friendly commute for mountain bike orienteering (MTBO), while skiers can opt to navigate a route on cross-country skis at a number of centres throughout Scandinavia and there are mounted holidays for horse riders too. Although not strictly speaking orienteering, there are also a number of walking holidays which teach navigation by compass – perfect for anyone looking to improve their map-reading skills, while others provide GPS courses for the more technologically savvy rambler. Often available as weekend breaks, basic traditional navigation courses teach the fundamentals of using a map, while the GPS courses concentrate on the essentials of using GPS on the hills, and how to get the best out of features such as “tracback” and “goto”. Some even have more formal classroom sessions to cover the use of advanced mapping software to simplify route planning. When it comes to eco-friendly holidays, it’s hard to find a better way to enjoy the sights than on your own two feet and with centres located in some of the world’s most scenic countryside, enjoying the great outdoors has never been more appealing.